AHMEDABAD: The state government has admitted on the floor of the assembly that 184 lions have died in two years, 2016 and 2017, with most deaths being from natural causes. With the lion census of 2015 revealing a population of 523 lions in the state, stakeholders are concerned about the continued existence and growth of the lion population. While the counts of two years show an average 18% of the lion population dying each year, experts say that the death rate is normal in a growing big cat population, and taking the death rate into account, the population of the big cats continues to have an annual growth rate of 2%. In its reply to a question raised by Dariyapur MLA Gyasuddin Shaikh, the government stated that in the year 2016, of the 104 lion deaths reported, 33 were of cubs. Similarly, in 2017, of the 80 lion deaths reported, 38 were of cubs. Experts feel that the death of cubs below the age of three comprised a major portion of total lion deaths. If 100 cubs were born, only 36 survived till the age of three, said officials. The government reply stated that in 2016 there were 12 unnatural lion deaths which constituted about 12% of the total lion deaths reported that year. However, unnatural deaths of lions jumped to 25% of reported deaths in 2017. Of the 80 lion deaths that year, 20 were unnatural deaths. 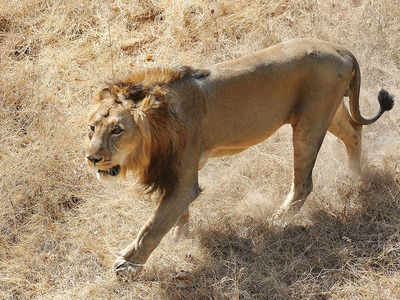 On man-made causes of lion deaths the government said it was constructing parapets over open wells, and has fenced the Surendranagar-Pipavav ralway track, as well as speed breakers on highways on stretches where wildlife crossed the roads. A study, “Demographic parameters of endangered Asiatic lions (Panthera leo persica) in Gir Forests, India,” by Kausik Banerjee and Yadvendradev V. Jhala, reveals that adult lions had died primarily due to natural causes (54.5%). Deaths caused by man were also substantial (43.2%) and were likely additive to natural causes. The study was carried out between 2000 and 2010.